Rivers are likely to enjoy smooth sailing as growing demand, limited new supply, and relaxed regulations support stronger operating results and possibly rating upgrades, Moody's Investors Service reports. Moody's VP/senior analyst Todd Gray. "But at the same time, the rising tide for the sector as a whole will not lift all the riverboat operators." Resorts (Baa2) and President Casinos (Caal). The analyst points out that many of these companies also operate land-based casinos, and that rating changes in any direction are also influenced by the per- formance of these other properties, as well as by management's financial and strategic policies overall. Iowa in 1991, the operators of such casi- nos have seen demand grow faster than supply. This is likely to continue to be the case, especially as new regulations in Illinois, Missouri, and Louisiana either eliminate certain operating restrictions in an attempt to increase tax revenues from the casinos or eliminate a source of potential competition. December 1999 over the same period in 1998. November to Bl from B2, in part because of these gains. He also says more consolidation among the industry is likely as existing operators are afforded limited opportu- nities for growth as a result of the same factors. 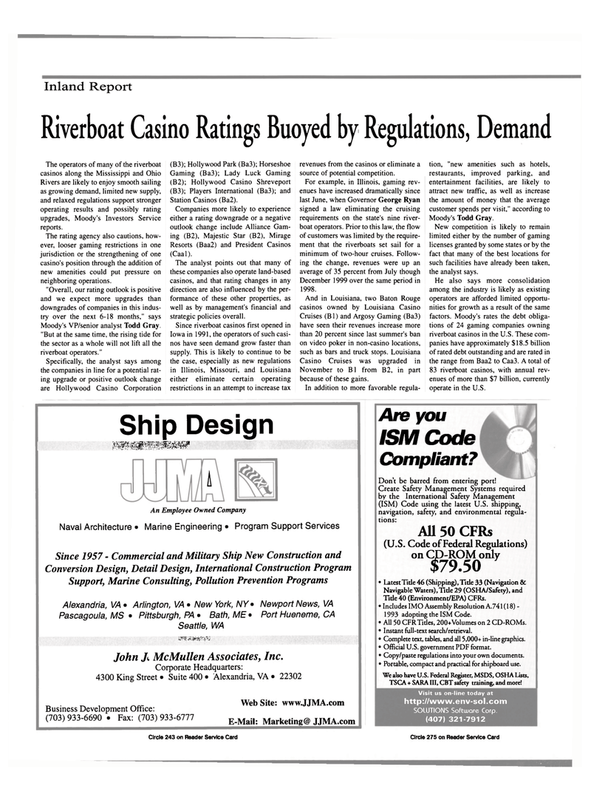 Moody's rates the debt obliga- tions of 24 gaming companies owning riverboat casinos in the U.S. These com- panies have approximately $18.5 billion of rated debt outstanding and are rated in the range from Baa2 to Caa3. A total of 83 riverboat casinos, with annual rev- enues of more than $7 billion, currently operate in the U.S.
Don't be barred from entering port! Tide 40 (Environment/EPA) CFRs. • Includes IMO Assembly Resolution A.741 (18) - 1993 adopting the ISM Code. • All 50 CFR Tides, 200+Volumes on 2 CD-ROMs. • Instant fiill-textsearch/retrieval. • Complete text, tables, and all 5,000+ in-line graphics. • Official U.S. government PDF format. • Copy/paste regulations into your own documents. • Portable, compact and practical for shipboard use. TSCA + SARA III, CBT safety training, and more!